Waste products from industrial operations, if not disposed of properly, have the potential to significantly impact the quality of our natural surface and ground water systems. Geoenvironmental engineering focuses on finding engineered solutions to contaminants that have impacted on groundwater aquifers. This is accomplished through field and laboratory work which allows both the hydraulic characteristics of the aquifer and the extent of contamination of the groundwater to be characterized. This data coupled with pilot scale tests allows the robustness of existing geochemical transport models to be tested thereby providing a greater understanding of how the full scale remedial project will perform over time. Remediation of inorganic contamination presents a tremendous challenge because the contaminants are often in elemental form and so cannot be "destroyed" like organic contaminants can. In situations where contaminants cannot be naturally degraded or immobilized external remediation methods such as permeable reactive barriers may need to be applied. These barriers are simple and effective passive treatment systems and are very cost effective. 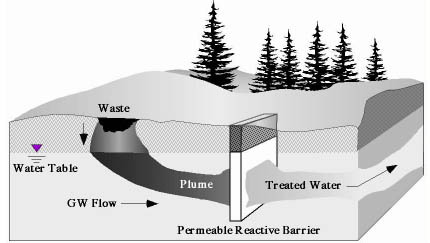 The following diagram is a schematic of a permeable reactive barrier for the remediation of groundwater contaminated with spent potliner (SPL) waste from the aluminium smelter industry. Leaching of SPL waste can cause elevated concentrations of fluoride and cyanide in the local groundwater. Figure 1.3. 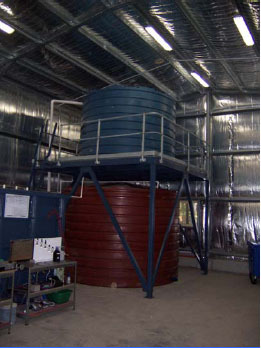 Storage tanks for contaminated groundwater. The 15kL upper (blue) tank stores industrial liquid waste prior to testing the in situ reactive barrier, whilst the 25kL (red) tank stores all post reactive barrier treated effluent. Figure 1.4. The multi-purpose reactive barrier pilot cell contains ten horizontal and four vertical sections which can be filled with various materials thereby producing a simulated aquifer in both the vertical and horizontal directions allowing the recreation of site specific geological conditions. Small monitoring wells in each section allow real time chemical analysis of reactive barrier performance. Figure 1.5a. Automated sampler which collects samples directly into Ion Chromatograph vials to allow rapid chemical analysis. Figure 1.5b. 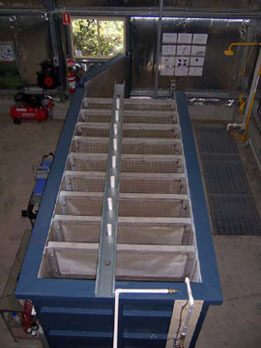 Flow through cells at the influent and effluent ends of the pilot cell allow continuous monitoring of pH, conductivity, and Fluoride, Calcium and Cyanide concentrations. Samples collected by the automatic sampler are analyzed using ion chromatography in the Geoenvironmental Laboratory which contains a state-ofthe-art Dionex ICS-2500 ion chromatograph which allows analysis of major cations and anions as well as free and complex cyanides. Figure 1.6. Dionex ICS-2500 Ion Chromatograph. 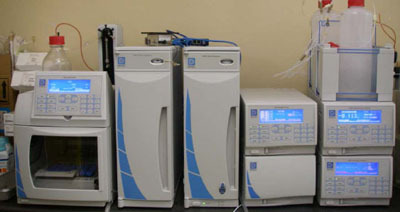 Left to right: AS50 Autosampler, AS50 chromatography compartment, EG50 eluent generator, GS50 gradient pump, EO1 eluent organizer (top), ED50A electrochemical detector (middle), AD25 UV/Vis absorbance detector (bottom). System controlled by Chromeleon 6 data management system (not shown). Since 1969 the Kurri Kurri smelter has continuously used the Hall-Heroult process to produce molten aluminium from the aluminium ore, alumina (Al2O3). This refinement process works by placing alumina and an electrolyte, cryolite (sodium aluminium fluoride, Na3AlF6), into carbon lined "pots" where an electric current is applied causing the alumina to dissociate into aluminium and oxygen. The carbon lining of the "pots" act as the cathode and have a life-span of around 5 years. When the "pot" fails the carbon cathode is removed from the "pot" shell and the "pot" is then re-lined with a new carbon cathode. The discarded pot-liner contains fluoride and sodium from the cryolite solution. Cyanide is also present and is produced under the extreme temperatures in the pot from the reaction between carbon from the cathode and nitrogen from the atmosphere. Historically, the spent pot liner waste (SPL) was disposed of in open unlined pits where leachate from the pile was caught in a leachate collection pond which was surrounded by a bund to collect any overflow. This began soon after the opening of the plant in 1969 and continued until 1992 when the environmental implications of the groundwater contamination around the SPL stockpile was realized. 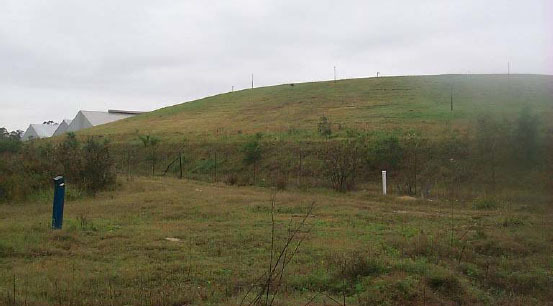 By 1995 the waste pile was capped thereby minimizing any further leachate production. 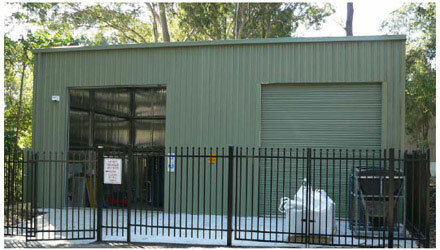 SPL waste is now stored in large, onsite sheds which allows the waste to be isolated from the surrounding environment. Figure 2.1. 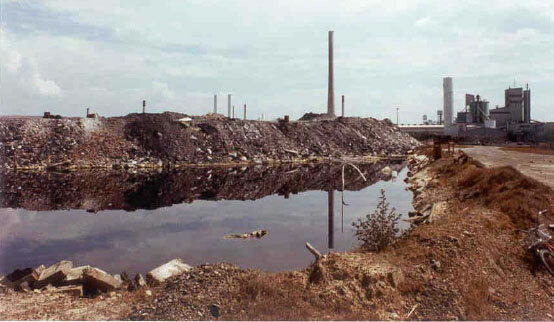 Industrial waste pile with contaminant leachate bunding (foreground) prior to capping. Figure 2.2. Industrial waste pile after capping with two monitoring wells shown in the foreground. Figure 2.3a. 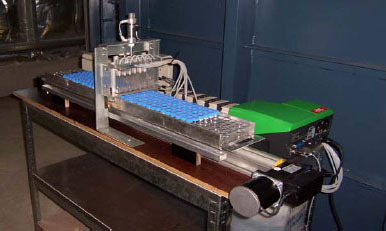 The University of Newcastle's CPT test rig. Cone penetration soundings are an accurate, expedient and efficient means of geoenvironmental site characterization for delineating site stratigraphy. The results obtained from groundwater monitoring were used to produce contaminant maps defining the extent of the contaminant plume. 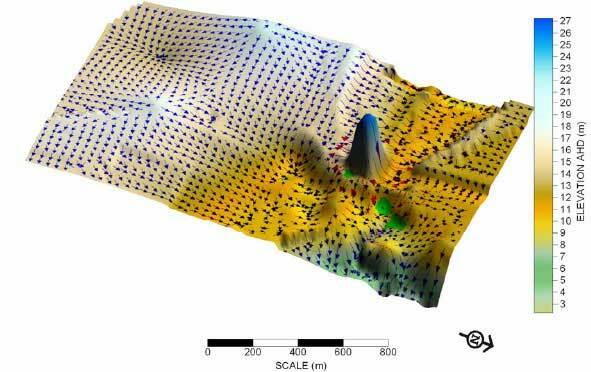 The maps, in conjunction with the hydraulic properties of the aquifer were used to make a 3D surface model and preliminary groundwater flow models using MODFLOW software to aid in the assessment of the most appropriate remediation method for the site. Results from corresponding laboratory and pilot scale tests will enable the most environmentally sound method of preventing further spreading of SPL contamination to be implemented. Figure 2.4. Fluoride Contamination Relief Map showing Groundwater Head Gradients from a Typical Winter/Spring Season (August/September 2001). Figure 2.5. Topography of filed site showing surface water flows to aid in determining spread of groundwater contamination with most significant contaminated areas shown in fluorescent green. Vertical axis has been exaggerated. Figure 2.6. 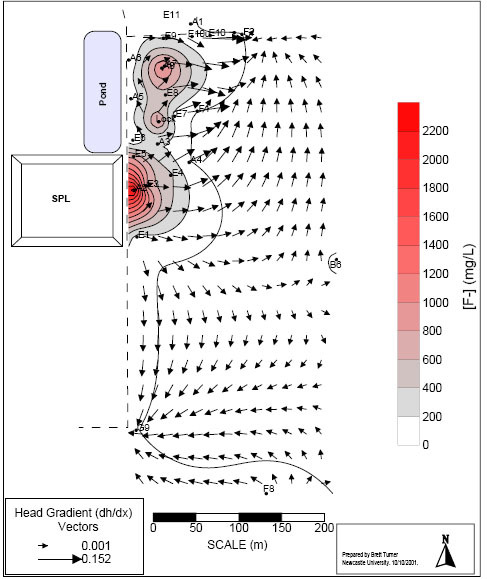 Calcite Permeable Reactive Barrier (PRB) model results from MODFLOW showing the reduction in fluoride concentrations transported from under the capped SPL pile at the field site. The left most figure shows results assuming no sorption/retardation (Kd =0) as expected, a Kd value of zero produces no change in the plume. A Kd value of 0.001 (middle figure) mostly contained the plume, albeit with a fluoride concentration exiting the PRB of around 100 mg/L. A Kd value of 0.01 (right figure) was predicted to be adequate for the PRB scenario described above. Note: the model process used was an extreme simplification using linear isotherms (most suited for sorption behaviour at low contaminant concentrations). At high pH (>9), fluoride sorption onto calcite should be modelled as a Langmuir isotherm. The calcite Kd value is 0.007198 L/g at pH 10.0 as determined in laboratory studies. 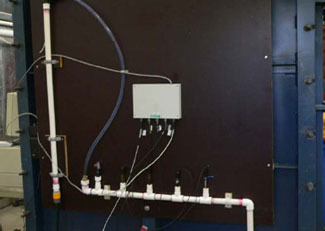 Calcite PRB installation shown as double line.